Editor’s Note: This page was in draft mode at the time of Father Kauffmann’s sudden passing, but he very much wanted this information to be online as a study reference. In a few weeks this note will be moved to the bottom of page, but the page will stay online. Please send corrections for typos or broken links and they will be fixed. Thank you. -Ed. 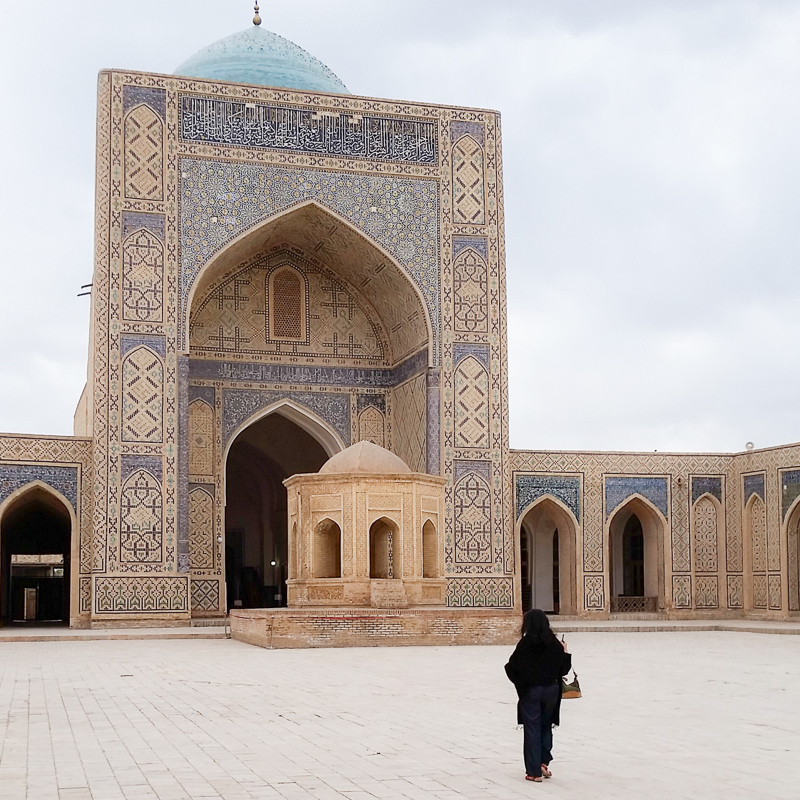 The Mir Arab Madrassa in Bukhara. In today’s world Islam has become a part of our religious landscape in the West. My travels throughout the Middle East and my studies in early Christian origins over the past several decades have created within me a desire to understand Islam and its relationship to Christian faith. Here are gathered some resources by several people whose whose opinion I trust, whose academic credentials I respect and I would commend them to your reading, to better understand Islam. These are sober and smart voices, involved in international Christian / Muslim dialogue that seeks mutual respect and understanding. Qur’an, A new Annotated Translation by A. J. Droge, Equinoxpub.com . It comes highly recommended by Gabriel Said Reynolds. Muslims Ask, Christians Answer by Christian W. Troll, SJ, newcitypress.com, in which Professor Troll offers a clear and simple presentation of getting a handle on the theological issues that are at stake in Islamic-Christian dialogue. 111 Questions on Islam by Samir Khalil Samir, SJ, Ignatius Press. Professor Samir is a Jesuit who is an author and professor at Saint Joseph University in Lebanon, and I highly recommend this book. The ancient legacy of the Christian faith in southern Turkey, Syria, and Iraq brings a richness to our understanding of Jesus. Although this ancient legacy may be hidden from our western eyes, it is a treasure to be discovered: a pearl of great price. This is a documentary movie, 197 minutes, “The Hidden Pearl.” Learn about the Aramean people before and after Christianity, about their language, their culture, their religion and traditions. This documentary will also give you an insight into the culture into which Islam emerged in the 7th Century. Click here to view: The Hidden Pearl . You may also enjoy exploring Professor Reynold’s webpage, which gives access to other well-informed resources. When Islam emerged into what is today Iraq, Syria and Southern Turkey, the Muslims encountered a Syriac Christianity. Professor Sydney Griffith at Catholic University of America presents a very good lecture that helps us to gain access to the 7th Century world. Click here to listen to the lecture: History of Muslim-Christian relations. Professor Remi Brague, a professor of Arabic and religious philosophy at the Sorbonne, in his book On the God of the Christians (and on one or two others) points out that the “Abraham” that the three religions (Judaism, Christianity and Islam) would have in common is a vague abstraction. For Islam, “Abraham was neither a Jew nor a Christian, but a true believer, and Muslim” Qur’an III, 67. Also see “Is Their God Ours?” by Sidney H. Griffith, in First Things. Dr. Nabeel Qureshi, who recently completed his doctorate at Oxford University in England, delivered a lecture on the Biblical witness of Jesus in conversation with the Quranic Jesus. The lecture is very spirited in that his purpose is apologetic, that is to give a reasoned defense of the Christian faith he professes. Nabeel Qureshi offers several video lectures that can be beneficial in our ongoing theological conversation to try to understand the growing number of Muslims in the United States. First of all, Islam is more than simply the Quran, it is a way of life. Qureshi gives us in this lecture an insight into how the practice of Islam shaped his life until his conversion to Christianity as a young adult. And I would recommend his lecture on the text of the Quran. BBC interview with Dr. Nabeel Qureshi (audio only). “What motivates them is neither insanity nor political radicalism. They are driven by a powerful religious impulse — and a craving for a bloody, apocalyptic showdown with the West. ISIS will wage war, and wage it constantly, in the hope of luring the United States into a massive invasion, in the hope of provoking a final battle that will usher in the end of the world. Another article worth reading is by Peggy Noonan, Administration Adrift on Denial. Enlightening: What ISIS Really Wants. There also are two videos that I highly recommend: The Radicalization of Islam, and Pope Benedict’s Regensburg talk.